We answer our phone with a live voice, 24 hours a day, 7 days a week. That can add up to 50+ days a year, we are open, when our competitors are not. This fact alone makes a huge difference in your return on your investment (ROI) and the true value when comparing property management companies. 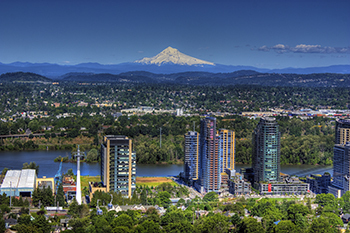 Known as the city of roses, Portland is a fantastic city with diverse neighborhoods and tons to do and eat. The official bird, is the Blue Heron and the official slogan is “A City That Works”. Unofficially Portland can be called the footwear capital of the world with powerhouse Nike, adidas, Columbia Sportswear, Keen and believe it or not, many more. Ironically Portland has only two professional sports teams, the NBA Portland Trailblazers and the MLS soccer team the Portland Timbers. In housing accommodations, you can find just about anything you want in Portland, from micro apartments to multi-million dollar mansions on the water or lake. From 1900’s vintage homes to high-tech green friendly homes, it’s your choice, they are all here. Portland has the Willamette River running through it, which has 11 bridges in 11 miles, sometimes nicknamed “Bridgetown”. Portland’s transit system is extensive and a leader in the nation, from electric rail to buses and even trolleys, jogging paths along the river and more. Whether you are looking for a tons of great restaurants, a beautiful home on the water, a fantastic location within walking distance to your favorite coffee shop, parks to play in, a rose garden to visit, a micro brewery or more, Portland literally has it all.